We’d love your help. 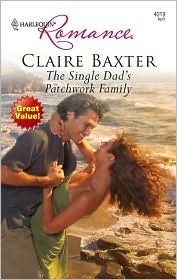 Let us know what’s wrong with this preview of The Single Dad's Patchwork Family by Claire Baxter. Chase Mattner has come to tranquil, secluded Leo Bay to raise his daughter. In their house by the ocean, he plans a simple life. Regan Jantz isn't looking for distractions, either. With a tuna farm to run and two young sons to bring up alone, she's got her hands full. But as single parents, Regan and Chase form a special bond. For so long their lives have been like jigsaws without the final pieces. Could a proposal from this gorgeous single dad make them whole again? To ask other readers questions about The Single Dad's Patchwork Family, please sign up. The Single Dad’s Patchwork Family by Claire Baxter is a standalone novel but can also be found in the Six More Hot Single Dads eBook Collection. Chase Mattner is a widower bringing up his young daughter by himself. He's a top shot lawyer who can afford a long-term sabbatical to spend on being a full-time dad. Regan Jantz is a divorced mother of two young boys. She is struggling to bring them up and to run the Tuna farm that she owns. Life is hectic, but she gives her all to her boys as much as po The Single Dad’s Patchwork Family by Claire Baxter is a standalone novel but can also be found in the Six More Hot Single Dads eBook Collection. Regan Jantz is a divorced mother of two young boys. She is struggling to bring them up and to run the Tuna farm that she owns. Life is hectic, but she gives her all to her boys as much as possible. When Chase and Regan meet there is an instant attraction, but with so much baggage between them, they are both convinced that they should be friends and nothing more. They start to spend time together with the children and all of them really enjoy it. The boys enjoy having a male in their life that they can have fun with, while Regan loves doting on Chase's daughter. They could be the perfect family together if they could just move on from the troubles of their pasts. trickled into Will’s hair. ‘You mustn’t think that way, Will. Daddy left for all sorts of reasons, but not because of you. Her voice thick with tears, she forced herself to speak firmly. ‘He loves you,’ she said as convincingly as she could. Claire Baxter has captured the heart of the ‘patchwork family’ beautifully and created two well-rounded and believable characters in Regan and Chase. It was a pleasure to share the journey with them and I fell in love with their families too! The Single Dad’s Patchwork Family, is a definite keeper for my shelves. This was my first read by Claire Baxter and I believe not the last one. The book overall was pretty good, although it's not as heart-warming as I would expect from "Harlequin Romance" line. The plot centers around 2 single parents, Chase and Regan, and their fear of relations for quite understandable reasons. My main complaint about this book is the heroine and her constant crying. She just wasn't likable & I never did warm up to her. Other than that, I enjoyed reading it. So all-in-all it was a cute, light read that gave me some distraction and smiles on a really hot day.